K hukha has been extremly fortunate to have some of the most honourable individuals who devoted their valuable time and resources to develop and achieve immense benefits for the Khukha community. 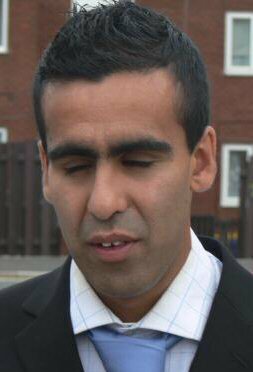 Khukha community is proud of Ajmal's achievements to become the Captain of English National Football Blind team. A jmal Maqsood son of Haji Maqsood Ahmed is from Liverpool, England. Although Ajmal was born blind, he managed to play for England National Football Blind team. In his captaincy, England's blind football team came 2nd in European Championship and qualified for Beijing, China Olympics which will be held in July 2008. He is confident that Engalnd has a very good chance to win a medal in Beijing. The football matches will be shown live on TV from beijing. Ajmal has won 60 caps for his country. He won 'Player of the tournament' in the blind tournament World championship in Argentina last year where he scored his first goal against Japan. His major achievement was to win the 'Britain's Male Sports Personality of the Year 2007' sponsored by nPower at the disabled sports award ceremony held at Villa Park statdium in Birmingham. He has also won a Merseyside sporting award. He is currently the Captain of National Blind football team and plays in midfield position. Ajmal's full story comming soon with pictures.